As the Western US lead coalition allies are dragging their feet trying to curb ISIS operations in the Middle East, it seems that the coveted “boots on the ground” could eventually come from the east – where China faces a growing ISIS-inspired subversive activity in the strategic Xinjiang province. 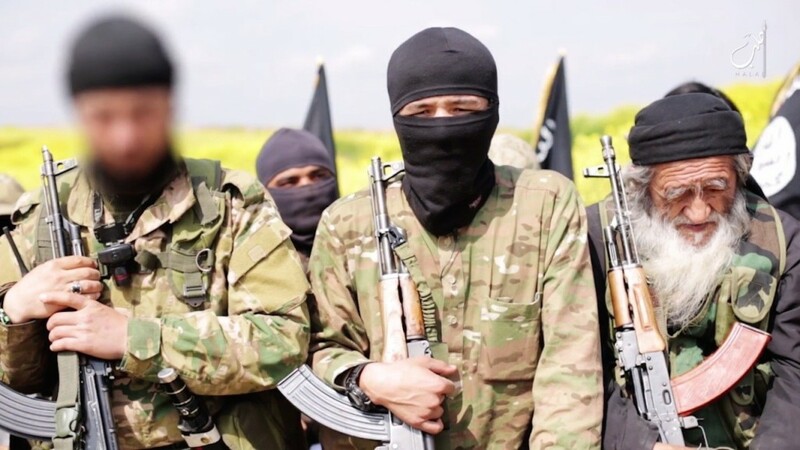 Shown in a video released by ISIS supporters on Youtube, this person, identified as ‘Bo Wang’ was the first Chinese national openly shown to be fighting with ISIS in Syria. The latest development in the creation of the revived Islamic Caliphate comes out of China. On 4 July 2014, ISIS leader Abu Bakr al-Baghdadi effectively declared war on China by publishing a map of its aspirant caliphate that threatened to occupy China’s Xinjiang, and named China first in a list of 20 countries that had “seized Muslim rights.” China’s Uighur Muslim population is known predominantly in the western regions of the country, which is often marginalized by the officially atheist Chinese government. Yin Gang, a West Asian and African Studies scholar at the Chinese Academy of Social Sciences, reported in a western news media, that hundreds of Chinese nationals are currently fighting for the Islamic State, citing previous examples of Chinese citizens joining al-Qaeda in Afghanistan. It is becoming apparent that Uighur separatists are joining ISIS in the Middle East. 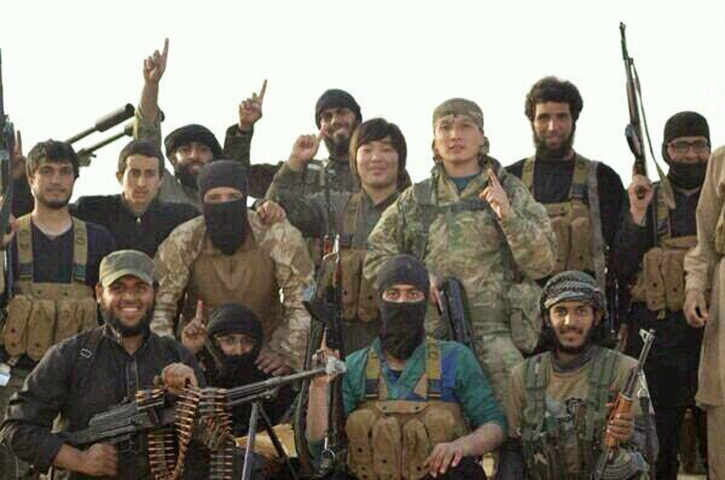 A group photo of foreign volunteers fighting with ISIS showing at least two unidentified but unmasked Chinese fighters. Many of the Uighur do not identify as Chinese and have long been resentful of China’s heavy-handed policies. Indeed, Uighur terror cells have already been active in China.The region has had intermittent autonomy and occasional independence, but what is now known as Xinjiang came under Chinese rule in the 18th Century. The Uighur culture leans more towards Central Asia than China and the recent Islamic developments have already created spells of unrest in the province. As result, Uighur commercial and cultural activities have been gradually curtailed by the Chinese state. 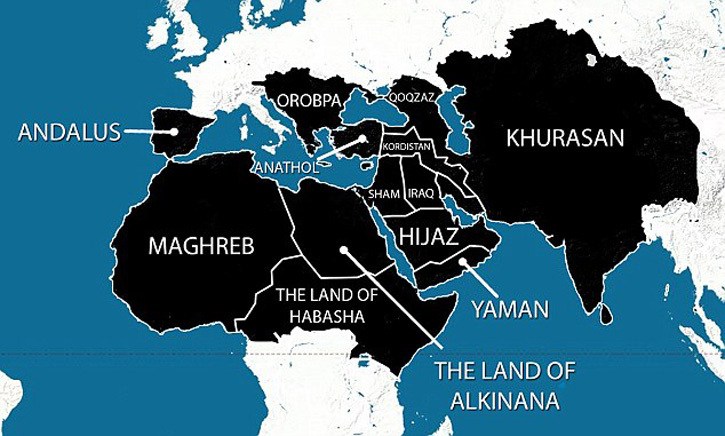 With Xinjiang comprising the furthest eastern flank of the planned caliphate, Chinese strategists will now have to worry about how ISIS’s pivot east will impact China’s energy security and its own march west across the new silk roads to the Greater Middle East. Although the Beijing government is maintaining strict security measures on all information, recent Photos are nevertheless circulating online in China of what is suspected to be Chinese citizens fighting for the Islamic State militant group ISIS. Though the photos initially surfaced some time ago, there still has been no official confirmation on the identity or nationality of the suspects, nor any indication as to where these photos were taken. However, unofficial sources in Beijing already expect Iraqi oil supply to figure heavily into its energy policy towards the Middle East, with China’s most productive upstream activities in the Middle East located in that region. As the United States and its Coalition allies are still dragging their feet in activities trying to curb ISIS operations, it seems that placing “boots on the ground” will eventually come from the Far East and Chinese forces might become the first candidates if ISIS will continue its subversive activities in the strategic Xinjiang province. China’s military forces, especially in number of fighting infantry cannot be underestimated. Numbering some 2.3 million active duty soldiers, with approximately 1 million reservists and some 15 million militia it is a huge force to be reckoned with in any confrontation which Beijing will decide to deploy. China’s foreign policy has traditionally been based upon an attitude of non-intervention. Their policy was codified in 1953 and later added to the Preamble of the Chinese Constitution. The fact is, that China’s primary objective is stability, and from their perspective, the surest way to destabilize a region is by intervening militarily. However, despite its best efforts to do otherwise, China will soon find itself entangled in the messy international struggle against Islamic-fundamentalist movements, once ISIS or its Muslim affiliates increase their active presence in China, or threaten its economic and strategic interests. Because of its economic interests in the region, China has recently deviated slightly from its non-interventionist policies by expressing support for anti-ISIS military activities. However, threats to its economic interests should be the least of China’s concerns. This is because ISIS is currently the greatest actual security threat China faces in the world. Chinese Muslim Uighur separatists have been joining ISIS in Iraq and Syria. Eventually (if not already) these battle-hardened Uighur separatists will begin to make their way back into China and open a campaign of terrorism on a scale previously unimaginable in China. In order to stem the flow of training, support, and weaponry coming back over its borders via the ISIS-trained Uighur, China’s largely untested military will have to gain needed combat experience, to be effective in counter terror activities. And time is already running out fast in China itself. The Muslim Uighur who have joined ISIS are receiving an elite education in terrorism and combat. They are building a valuable network of different Muslim extremist groups who can supply them with weapons, as well as logistical and ideological support. Perhaps the most significant lessons being taught to the Uighur extremists is in organization. Things have escalated in 2009, with large-scale ethnic rioting in the regional capital, Urumqi. Some 200 people were killed in the unrest, most of them Han Chinese, an ethnic group making the majority of mainland China. A most spectacular terror attack happened right in China’s Beijing’s Tiananmen Square in October 2013, when a suicide bomber drove his car into a crowd killing several people. Another such incident happened on May 2014 when two cars ploughed into a market in Urumqi and terrorists threw explosives killing and wounding scores of civilians. In August 2014 China has executed eight people for “terrorist” attacks in its restive far western region of Xinjiang, including three who “masterminded” a dramatic car crash in Tiananmen Square in 2013, state media said. Although maintaining its traditional non-intervention policy in Mid Eastern conflicts, China is already showing uncharacteristic support for foreign military actions against ISIS. Even more unusual is China’s open support for US airstrikes in Iraq and Syria. So far, the Chinese policy remained virtually unchanged regarding any active intervention, but this could change rapidly once ISIS-trained Uighur extremists begin to trickle back into China. Then the Chinese government will find itself battling an entirely different element. Once this happens, the world can expect to see a China that is much more willing to involve itself in military intervention, creating a historic precedent for China in international disputes. This willingness to use force will have profound implications on China’s ongoing territorial disputes with surrounding Asian nations, in which Pyongyang has already been flexing its military might in this context. Should the influence of ISIS escalate into an organized terror threat inside China, one can expect a new military superpower, as China expands its military capabilities into unknown proportions. Previous Rays of Light in the Middle East?